This Poetic Present: Trip to Haiti Coming Up FAST! Leave for Haiti in 6 days. Libby picked out books and socks of her own to give away yesterday.God is doing a great work in her. She wants to know how to fight Satan and his demons with her prayers so we talked about that for quite some time. She prayed over Keemberlie yesterday with such sincerity and concern. One family - on Mother's Day - found out they are not matched to a child they have been pursuing since late March. This is not the kind of news someone wants to hear on Mother's Day. I was heartbroken for them. Please lift up that family as they pick up the pieces and try to figure out what to do next. This is not the kind of news we want to hear right before we hand deliver our dossier and first half of international fee. Need you all to pray for me to have wisdom and discernment when I am in Haiti. Much is going on that I can not share here. Need to have in writing from HCRM that Keemberlie Julien is matched to us. The Pastor who runs Haiti Children's Rescue Mission has asked me to sing at his church next Sunday. That will be an honor. He told me to bring a CD player with me so I'm not sure there is any sound. I don't even know if there is a place to plug in the CD player. But I do know I am supposed to sing "You Are God Alone" over that place. Everyone in that church has lost someone and/or a home from the earthquake. But in the good times and bad He is God alone. Have plans to pray over the orphanage and all the nannies/staff. Please ask God to give our team favor with Pastor Jean Fritz, Madame (his wife), the staff and children. 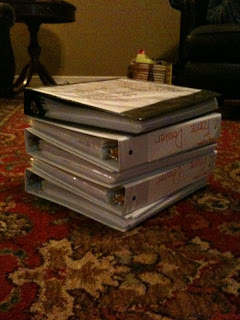 Those are 1.5 inch binders - and they are FULL! Getting that ready has consumed any/all extra time this momma has had for the last 2 months or longer. Pray for Billy and Gracie as they remain behind. Billy will be a single dad to a brave, walking, curious 15 month old for 5 days. God bless him! I apologize for the random way I am writing. Just got to get out the essential facts for prayer needs and then move on with the day. So much to do!!! THANK YOU, again for the donations. And THANK YOU for praying! We really need to be covered in prayer for this trip! 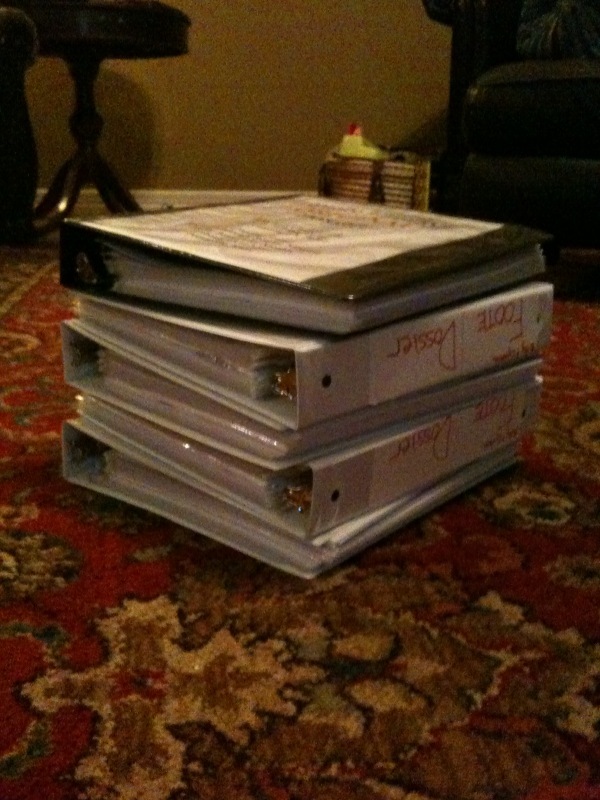 It is incredible to see the drive you have by looking at the stack of binders. Your love for this child and your trust in God is very clear. Praying so much for you and your family! Praying with you, sister! Love you! Catching up--and covering you up in prayer. Love you, Cindy my Cindy. Be blessed--WHENEVER He allows you to go!